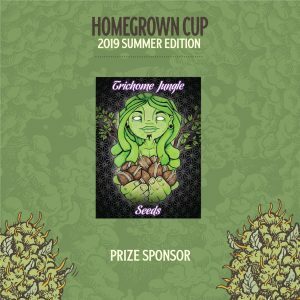 HomeGrown Cup | The HomeGrown Cup is an annual Cannabis Cup since 2015. 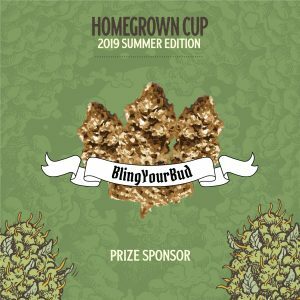 We want to highlight the benefits of growing your own cannabis for personal use, whether it’s recreational, medical, therapeutically, or a combination of all those. With the HomeGrown Cup, we lean on an old tradition of celebrating the bi-annual agriculture harvests at the end of the seasons. 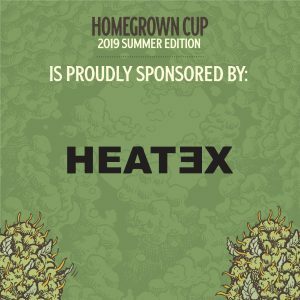 The 5th edition of the HomeGrown Cup will be held on June 15, 2019, in Tilburg (the Netherlands). 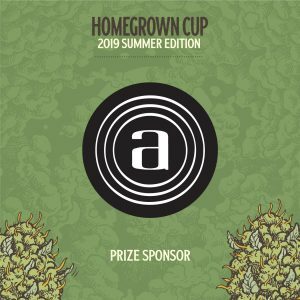 2015 saw the first edition of the HomeGrown Cup, leaning on an old tradition of celebrating the annual agriculture harvest at the end of the season. The 2016 edition was held on December 17, 2016, in Eindhoven (the Netherlands). The 2017 edition was held on December 2nd, in Tilburg (the Netherlands). The 2018 edition was held on December 15 in Eindhoven (the Netherlands). Can I buy tickets to this event? There are no public tickets available (or judge packs for sale). However, competitors must pay 50 euros per entry (max 3, in different categories) to enter. How much do I need to enter? You can find the quantities in the registration form. You cannot send in your entry, but you hand it in on the day before at a location which will be communicated after your registration has been confirmed. Judging is a hard job and takes all day. You can bring a friend for free if you enter two categories, or bring two friends if you enter three categories. You can bring a friend if you enter one category too, but then it costs 30 euros extra on top of your entry fee. For these 30 euros, you get an additional t-shirt, goodie bag and food and drinks. Is this event in Amsterdam? 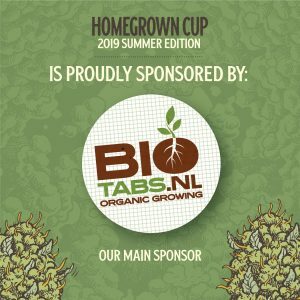 No, the HomeGrown Cup is not held in Amsterdam for various reasons. In 2019 the cup takes place again in Tilburg, which has plenty of cheap accommodations available for the weekend. But the event finishes early enough for you to drive home or even take the train back home. All spots for the 2019 summer edition are forgiven. Registration is no longer possible. Normally, your registration will be accepted. However, we as an organisation uphold the right to refuse you. With the Solvent category, we only accept quality products this year to protect the health of our competitors. After we checked your registration and emailed you back in case something was missing, if everything is in order you receive the next instructions. 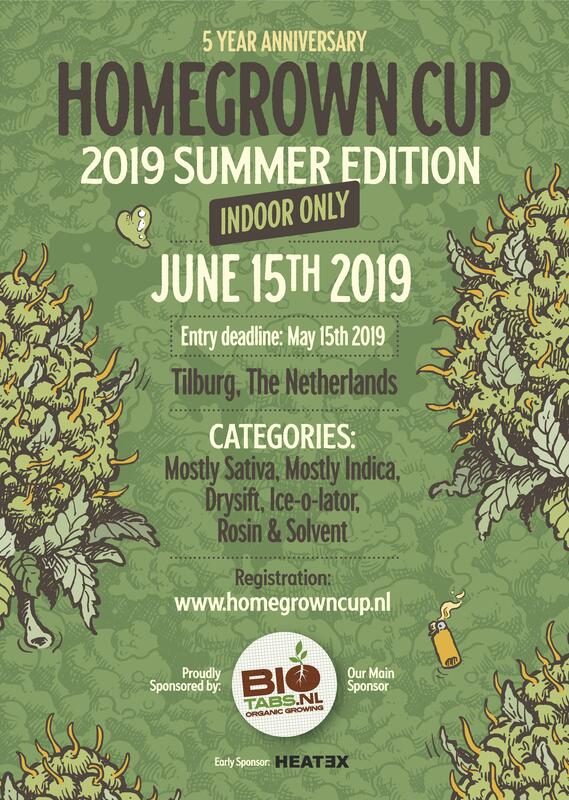 You are to drop off your entry in Tilburg the day before, June 14. You pay 50 euros per entry (max 3 entries). The address will be communicated on week before. Only the competitors themselves are the judges! Free food and non-alcohol drinks all day. Alcoholic drinks can be ordered at your own costs. Award Ceremony to honor the winners and hand out the prizes. 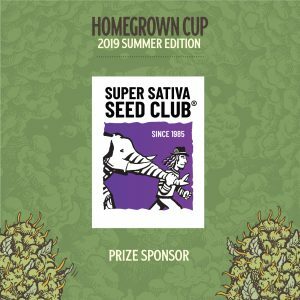 ‘Een evenement waar amateurs, coffeeshops, cannabis social clubs, zadenbanken en growshops het tegen elkaar opnemen in een strijd om de beste wiet (en de beste hasj en concentraten ook tegenwoordig).